1. Matilda based on the novel by Roald Dahl - This is probably my absolute favorite Roald Dahl book... by probably, I mean it is. I'll be honest and say that I haven't read them all, but I love this book to pieces. The movie is also a favorite. It brought all the magic and whimsy from the book to life. Not to mention, Mara Wilson is adorable as Matilda. 2. To Kill a Mockingbird based on the novel by Harper Lee - This is one of my absolute favorite books. Ever. The movie, with Gregory Peck as Atticus, is one of the best ever made. I remember watching it for the first time, right after our class finished the book, and I fell in love with it. It's such a great story and they did an excellent job with the film. Totally award-worthy. 3. The Lord of the Rings based on the novels by J. R. R. Tolkien - So yeah, I've clumped these all together, as usual. Another all-time favorite turned into a movie (or three, in this case). I was so very nervous about this one being translated, but I needn't have been. I think it helps that the people who made the movies were HUGE fans of the books. They stayed really true to the novels and they made a beautiful, wonderful adaptation. The film is stunning, the cast is amazing and the music is to die for. I can never watch it too many times. 4. The Perks of Being a Wallflower based on the novel by Stephen Chbosky - This is one of the absolute best adaptations I have ever seen. Then again, it's probably due to the fact that the author had a huge part in the screenwriting, directing, etc. The casting is also amazing and the sensitive subjects were handled with so much respect and thoughtfulness. This book has such a special place in my heart, and now the movie does too. 5. The Help based on the novel by Kathryn Stockett - This book really moved me in a lot of ways... the movie had the same effect. The casting was so well done and they stayed true to the book. Both are so good, it's almost difficult to pick a favorite... almost. The book is still better. 6. Sense and Sensibility based on the novel by Jane Austen - My favorite Austen novel. I adore and can kind of relate to this story of two sisters. Though I do love the Kate Winslet/Emma Thompson version, my favorite has to be this one (the BBC one). It's just gorgeous and so spot on, how could I not love it?! Plus, lots of swooning. Lots. 7. 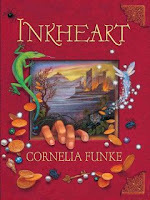 Inkheart based on the novel by Cornelia Funke - Though this movie deviates from the book in a lot of ways, I still really love it. It still has that sense of adventure found in the novel, which is very important. I also like a lot of their casting choices; Eleanor and Dustfinger are almost exactly how I imagined them. This series is one of my favorites ever and I'm glad this movie didn't tarnish my love for it in any way. If anything, it only enhanced that love. 8. Ella Enchanted based on the novel by Gail Carson Levine - Holy cow, this movie was SO BAD! It was cheesy, the costuming looked cheap and it was just poorly made. The only good thing was Hugh Dancy. He's yummy. The book is so incredible, I just cringe whenever I think of how badly they killed this story. 9. City of Ember based on the novel by Jeanne DuPrau - I LOVE this series. The whole thing. I love the whole idea behind it and the storytelling is just so compelling. I was actually kind of excited to see this movie, instead of being scared. I wanted to see Ember come to life! Then I watched it. Oh my word, you guys. Just don't do it. Don't watch it. Not only did it completely butcher the book, it's an awful movie. It's almost like it makes the book into a joke or something. I hate it. I hate it oh so very much. Do yourself a favor and forget it even exists. Read the book, though. It's amazing! 10. The Jane Austen Book Club based on the novel by Karen Joy Fowler - This is one case where I definitely liked the movie more than the book. In fact, I kind of hated the book. I really do love this movie, though. It's so good! And again, Hugh Dancy, ladies and gents! Are there any book to movie adaptations you're particularly fond of? Any that make you cringe and want to throw things at the screen? What about movies you *gasp! * enjoyed more than the books? Let me know in the comments below! Oh my goodness, it was a horrid movie. The book is so good, too! 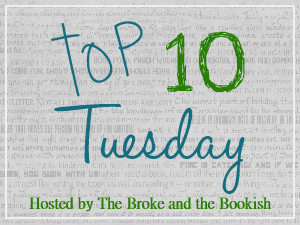 I'm a huge fan of the top three, the rest of the list is awesome too :) Thanks for sharing! The Help is so good. I almost cried... and I'm not a crier! You may enjoy the book for The Jane Austen Book Club, but I certainly didn't. I saw the movie first and loved it, so I had to read the book. A big disappointment for me. The Lord of the Rings is such an amazing movie - all three of them are. I really need to try and read the books. My husband read them and said the movies were a good adapatation. I really wish I put City Of Ember on my list. I think I blocked out the existence of the movie because of how terrible it is. The books are excellent. Great pick! Right?! It was so horrid. So incredibly awful. Ugh. I love the LotR movies. They made my best list, too. I haven't read Ella Enchanted, but I've heard the movie was a pretty bad adaptation. Great list! Ooh, Matilda. Still one of my favourite books ever! And a great film, the characters are just how I imagined them. Ella Enchanted was on my "worst" list too! Love the book (I have read it countless times) and really they just butchered the story with that movie. It really shouldn't even have been called an adaptation, the storyline was so different that they should have just changed the names and marketed it as a film on its own!